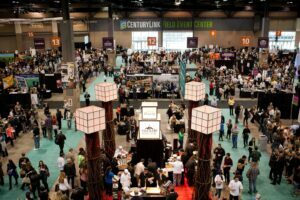 With all those wines to try, attendees needed to keep their stomach full and once again, Taste Washington did not disappoint! So many amazing restaurants participated and brought their best bites. From the prawn and Berkshire pork dumpling with pickled vegetables, black garlic cilantro emulsion and ponzu sauce (say what?!) at the Barking Frog booth to the chèvre cheesecake topped with toasted almonds and compressed apples at RN74, there were amazing treats at every turn. In fact, the incredible food is always the biggest surprise for me at Taste Washington. Now that Taste Washington is over and Washington Wine Month is coming to a close, how do you keep the fun going all year round? Easy! There are so many options close to Seattle and all over Washington State to try great wines and, of course, to find great food. It’s spring time in Seattle and that means rosés will be released soon. 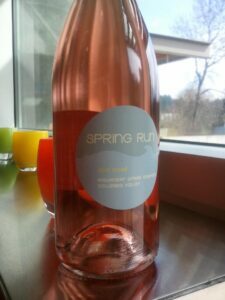 One of our favorites, Novelty Hill-Januik Winery’s 2012 Spring Run Rosé is actually being released TODAY, March 27th. The start of rosé season means summer sun and chilled wines on the patio are just around the corner, and who doesn’t love that? Start looking for these in tasting rooms and get excited for warm weather to come! Come fall, we have the Harvest season. This is a great time to go out to Walla Walla and witness grapes being harvested and prepared for the delicious 2013 vintages. Many wineries have Harvest events, so be on the lookout around the August/September/October timeframe. The weather in Eastern Washington is usually gorgeous this time of year too, a nice chance to get some late summer sun. If you were one of those people who flocked to the Stella Artois Café booth at Taste Washington and prefer your beers to your wines, there’s always something for you too! In fact, this weekend is the Cask Beer Festival, hosted by the Washington Brewer’s Guild. Unique, cask-finished beers are brewed by many breweries around the area and for some this will be the only time you can get them. This event takes place at the Seattle Center and is popular so get your tickets now if you’re interested. Craving that prawn and pork dumpling from Barking Frog or the chèvre cheesecake from RN74? You can still check out the Taste Washington website for the list of restaurants who participated and go try them out at their brick-and-mortar establishments. 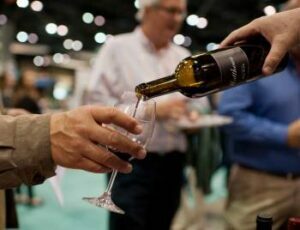 In fact, if you attended Taste Washington and still have your ticket stub you can use it to score some amazing deals at those restaurants, wineries and exhibitors who attended. 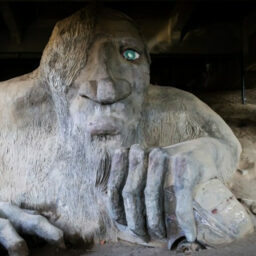 In Washington State we’re lucky enough to have amazing food, wine and beer at our disposal all year round. Come visit and let us know which one becomes your favorite!